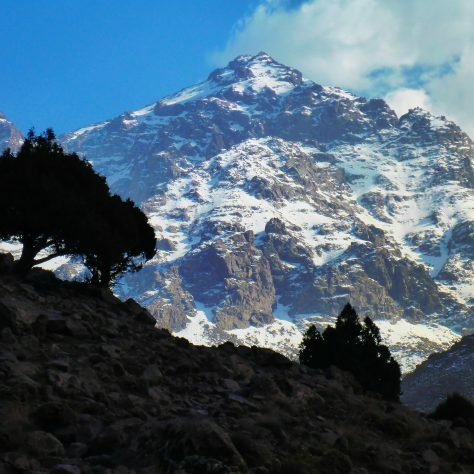 A winter expedition to Jebel Toubkal, 4,167m, is a very different proposition to a summer attempt, although it follows a similar itinerary. Climbing the mountain between November to February makes the summit ascent a more extreme challenge with crampons and ice-axes likely. The highest peak in the Atlas Range, it might be on our doorstep but it offers a captivating contrast to the mountains we’ve come to know and love in Europe. Our winter itinerary gives you the best chance of summiting this iconic mountain as few others have, while still offering a taste of wonderful Moroccan culture in a short timescale. We start in fascinating, frenetic, other-worldly Marrakech before heading for the Atlas foothills. At Imlil we meet our mule team and climb to the high refuge that is our mountain home. Passing ancient villages, dominated by an enormous Kasbah, we’ll meet hospitable Berbers offering refreshing drinks and showing us beautiful mountain crystals. We stop often to marvel as the high mountain scenery opens up around us. En route, acclimatisation is via Ouanoukrim Peak. You’ll be carefully instructed in the use of winter climbing equipment and the nights are spent in warm comfortable refuges. Leave the finer details to your guides and immerse yourself in this unique and satisfying challenge. Here you will set off on a 6-hour trek out of the Imlil Valley and into the Azzaden Valley. Along the way, you will pass breathtaking high mountain scenery including Tizi n’Mzik at 2,450m, the refuge at Azib n’Tamsoult and the Ighouliden waterfalls before reaching our rest point for the night at Azib n’ Tamsoult. As we pass the 4,000m mark the whole of the Atlas range opens up in front of us before we get a full, magnificent 360-degree panorama at the summit. The silence is remarkable, the High Atlas is unforgettable. Once we’ve had time to contemplate what we’ve just achieved, we head all the way back down to Aremd Village. Stopping for lunch as we wind our way down, we’ll be picked up at the bottom and taken to Imlil to our fabulous hotel – either the Kasbah du Toubkal or Dar Imlil – where we’ll spend the night and have a well-earned rest. Bear in mind that the refuges also have blankets which you can use in conjunction with your sleeping bag and a liner if you are a cold sleeper. Silk is best for keeping the bag clean and you a little warmer. We recommend you have a dental check-up before your trip. New fillings can be an issue at altitude if there is an air pocket left in the gap. We recommend you take at around £150 – £200 in Dirhams onto the mountain in small denominations. This will allow for tip money (£60 – £80) plus any extras like drinks, beers or snacks in the refuges. Small denominations are recommended as it may be difficult to obtain change and it will be easier to divide tip money. The meals on the mountain will be simple yet fresh, nutritious and reasonably varied. We try to ensure that dietary preferences are met and that local ingredients are used. Breakfast is typically bread and jam, porridge or muesli, with plenty of tea and coffee. Lunches can consist of cold vegetable salads, usually with a hot dish to go with it, from soup to pasta. Evenings will tend to be vegetable or meat tagines, couscous or pasta. The underlying aim is to provide balanced, nutritional meals packed with carbohydrates to refuel hungry bodies and to replenish stores for the next day of activity. In Marrakech we stay in a well-located, charming mid-sized riad where you will be assigned to share with a room-buddy unless travelling with friends or a partner. Single supplements are available at additional cost. We advise you to check with your GP surgery or a travel clinic on the latest advice about vaccinations and to ensure you are up-to-date. You will need to bring your specific medication that you take for any medical condition that you have, and pack this in your daysack. Please remember to pack plenty of spare medication in case you lose them or they get lost in transport. It is also worth taking a simple first aid kit such as simple painkillers, Compeed or similar for blisters, plasters, antihistamines and perhaps insect repellent. Other medications which can be useful are Ciprofloxacin antibiotics and Loperamide which helps to ease diarrhea. Altitude specific drugs such as Acetazolamide (Diamox) may also be useful. If you are unable to get hold of any of these then please don’t worry, as your Expedition Leader will have these in the trek first aid kit. Accidents can happen and anyone undertaking these adventures has to accept there is a degree of risk due to the very nature of the challenge. Our mountain crew are all experienced in dealing with problems that may arise. Our 360 Leaders are highly experienced in the field. They all have wilderness first aid skills and can handle any emergency to the highest level of competency. For minor ailments, they carry basic first aid kits. They are also equipped with satellite phones if they need to engage our pre-planned emergency evacuation procedures. Both long sleeve tops and trekking trousers are recommended rather than shorts. Long sleeves and trousers are recommended as a deterrent to insects, scratches from bushes and to act as sun protection. Do keep an eye on sunburn, even though it’s winter. The prevailing conditions of the day on the mountain will dictate what you feel like wearing. And the layering system never fails. If you’re cold, put a layer on, if you’re hot, take one off. What waterproofs should I bring? As much as we’d like to guarantee eternal sunshine, we can’t fix the weather for you. You should bring a hardshell waterproof jacket and overtrousers and they should be accessible. It is quite possible to be caught out in an afternoon rainstorm low down on the mountain or snow higher up. Once you get wet and your core temperature drops slightly, it becomes very hard to warm up and dry out your clothing. Waterproofs should be breathable Goretex material or similar to save you drowning in your own sweat. Additionally they can be used as an invaluable wind shield to protect you against the effect of wind-chill when a strong wind blows. What is the best type of footwear to use for this trek? A wide range of suitable boots are on the market and further advice as to which brand names are available can be found online or at your local outdoor store. The leather / synthetic combinations are endless and each with their merits. Our best advice is to try them on, walk up the ramps in the shop to check their grip – if you think they’re comfortable, and will be for several hours a day, buy them. Make sure you practice your training walks in your boots well in advance of your trip to ensure your boots are well broken in and not causing any problems. While you are most likely to be using crampons, your boots don’t need to be highly technical, just capable of taking a C1 crampon, but you can get B2 boots if you will be doing more expeditions on glaciers. Will I need to wear crampons? We’re walking on condensed snowpack as opposed to glacier, but we will need to wear crampons and carry a trekking longhandled ice axe in order to prevent ourselves slipping and sliding back down the mountain. If these are new to you your guide will teach you how to use them and ensure you have enough practice at using them before we set off for the summit. Fortunately mules will be the taking the strain for this trip, but be nice to them! Pack no more than you would want to carry yourself: 15kg is the limit and should be more than sufficient on such a comparatively short trip. Any extra weight such as spare clothes etc. can be left at the hotel before you head for the trek. The muleteers will not look favourably on overweight packs. Duffel bags are ideal for this sort of trip. Whatever bag you go for make sure it is robust and has a large capacity. As one goes higher in altitude it becomes harder to pack the bag and some people struggle closing their bags due to bulky sleeping bags and other pieces of kit. It will be far better having a large capacity bag with extra room (after all air doesn’t weigh much) than having a bag too small and finding problems packing your kit. Even having a 100 litre plus duffel bag is not too large. You should bring a daysack with you of approximately 30 litres for personal gear which you will carry yourself. Each day you should only be carrying the following: waterproofs, warm top, warm hat, gloves, 2 litres of water, snacks, camera, sunscreen, lipsol, head torch, minimal first aid kit. Anything else is considered more of a luxury than a necessity. It is important to go as light as possible as weight makes a huge difference at altitude. These should be rated within a Comfort Rating of 0 to -5 centigrade and depends a little on whether you are a warm or cold sleeper. If you feel the cold, bring a warmer sleeping bag. At the refuge it is not unusual to experience surprisingly chilly nights and a good night’s sleep is important. Ensure you have a sleeping bag that has this Comfort Rating rather than the Extreme Rating. Sleeping bags can be enhanced by using an inner fleece or silk liner and the refuges also provide blankets so you can always have an extra blanket on top. The idea is to be as comfortable and warm as possible in the night which will help to ensure a good night’s rest for the challenge ahead. They are highly recommended and are worth their weight in gold on summit day. Our guides tend to wear them every evening around the refuges and may well be appreciated on summit day. A layer system comprising of several layers of base layers, fleeces, and jackets will suffice on the climb but nothing beats the efficiency of a good down jacket (especially when topped with a waterproof layer). Thereafter we will descend to Refuge du Toubkal at 3,200m. We aim to be here for about 2 pm-3 pm. We hope to have about 45 minutes on top! With the aim to be back at Refuge du Toubkal for about 2 pm for a 1 ½-2 hour lunch and tipping ceremony before starting the long walk back out to Imlil, which takes about 5 hrs. We anticipate to arrive back at our stunning riad in Imlil at about 7 pm. Short and heavy rain and snowfalls can be expected in the mountains during the winter months as moist Atlantic air is forced up beyond its dew point by the mountain range, but they don’t normally last long. Often we’re in luck and a big area of high pressure can come in giving us clear crisp days, with starry and decidedly chilly nights as temperatures drop well below freezing. Back in Marrakech, temperatures will be very comfortable, akin to a fair spring day in the UK, with the odd risk of showers. Our kit list reflects these eventualities. 360 Expeditions will be booking flights on your behalf. We generally fly with Easyjet from Gatwick Airport as they are one of the few airlines providing direct flights to Marrakech. We will confirm flight times once flights are booked and provide boarding passes approximately 4 weeks before departure. There are direct flights to Marrakech from other UK regional airports so please do let us know if you are interested in flying from another UK airport and we can look into this for you. Physical preparation does not have to be Herculean: concentrate on cardio vascular exercise during the week by taking short runs when time allows and try to spend at least 2 weekends a month going on good long walks (longer than 6 hrs) carrying a rucksack of around 8 – 12 kg, and head for the hills. This kind of regime will not only prepare your body for carrying these loads but will harden your body against the big days on the mountain itself. In addition it will help break in your boots and get used to your equipment. In combination this will pay dividends when you reach the mountains. What currency is should I bring? Any advice on tipping the local crew? It’s a standard European adapter (normally round two pin)which you can buy anywhere in the UK and at the airport if you’ve left it to the last minute. Can I use the satellite phone? Yes you can use the satellite phone if you really need to make a call, it’s £3 per minute. Mobiles will work sporadically. But with both of these, there is limited charging availability (the refuges normally have generators), we will use the satellite phone very sparingly, bear that in mind with your mobile.